1. For the pastry, pulse the flour, almonds, icing sugar and butter in a food processor until it resembles fine breadcrumbs. Add the egg yolk (save the white for glazing) and 1 tablespoon of cold water and pulse again. Shape the mixture into a ball, wrap in clingfilm and place in the fridge for 30 minutes. 2. Place the sugar in a small saucepan and heat until it starts to melt. Keep a close eye on it, as it will burn easily. Swirl the pan and cook until the sugar is a dark amber colour. 3. Add the nuts to the hot caramel and stir until they are all well coated. Turn out onto a lined baking tray and leave to cool until set. When the brittle has hardened, break it up into smaller pieces and pulse in the food processor until it forms a coarse powder with a few chunky nut pieces. 4. Preheat the oven to 180°C, gas mark 4. Roll the pastry out to ½cm thickness and cut 8x11cm circles using a pastry cutter. Press the circles into a greased muffin tray, pushing the pastry up against the sides. 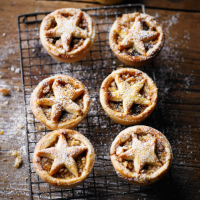 Divide the mincemeat between the cases and cover the tops with the crushed caramel mix. This will melt in the oven into a crunchy nut layer. 5. Cut out 8 small stars from the remaining pastry dough and place on top of each pie. Brush with beaten egg white and bake for 20-25 minutes or until golden and crisp. Allow the pies to cool for 10 minutes before removing from the tin as the topping will be very hot. Serve warm with cream and a glass of mulled wine.